“Some people enjoy dancing in the rain but some really hate getting drenched. Some people enjoy the stock market volatility but some get killed by the same volatility.” Different people perceive the same thing differently, but all of them seek one thing above all else: CLARITY! In the speaker event hosted by Kolkata chapter of IAIP, on 30th July, 2014, the esteemed speakers from NSE Gauri Shankar, product manager for equity derivatives and Anirban Kundu, Manager – CRM of eastern region strived to provide clarity on India VIX Futures, NSE Bond Futures II & EMERGE- NSE SME platform. India VIX indicates the investor’s perception of the market’s volatility in the near term. From the best bid-ask prices of NIFTY Options contract, a volatility figure (%) is calculated which indicates the expected market volatility over the next 30 calendar days. Higher the India VIX values, higher is the expected volatility and vice versa. India VIX uses the computation methodology of CBOE, with suitable amendments to adapt to the NIFTY options order book. For this, the best bid-ask quotes of near and next-month NIFTY options contracts (traded on the F&O segment of NSE) are used. The computation methodology gives rise to a unique situation which all users of NVIX must take note of. Because F&O contracts on NSE are settled on the last Thursday of every month, there can be more than 30 days between two consecutive expiries. 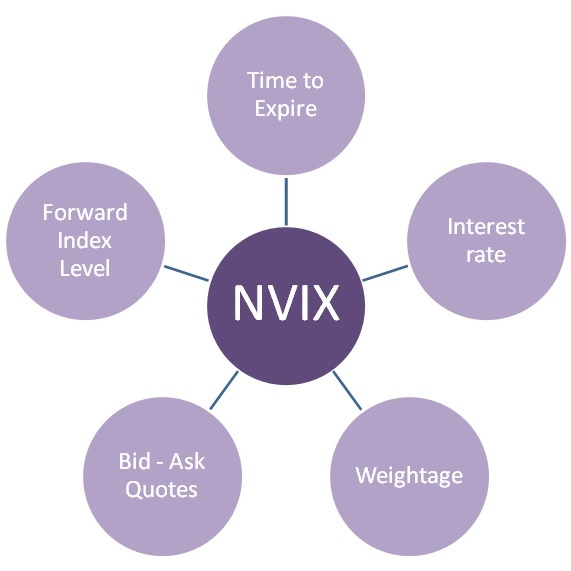 NVIX values are mandatory computed based on near and subsequent month bid-ask spreads. This could result in situations when the near month values carry more than 100% weight while the far month values are assigned a negative weight. The speaker exemplified the computation methodology which acted as a concept builder for the audience. The next session was addressed by Anirban who delved into the product specification of NSE Bond Futures II, which has been newly launched after suitable modifications. The product is being well accepted by the market participants as evidenced by its heightened turnover. At the start of the final part of the presentation, the speaker asked the audience as to how many of those present are associated with NSE-EMERGE. The weak response triggered the need for creating awareness about the initiatives taken by NSE to promote the SME sector. EMERGE symbolises the aspirations of a large number of entrepreneurs having potential to unlock and emerge on a bigger scale. EMERGE is a credible and efficient place to bring about convergence of sophisticated investors and emerging corporates in the country. It offers opportunities to informed investors to invest in emerging businesses with exciting growth plans, innovative business models and commitment towards good governance and investor interest. The concerns of the audience over the company credentials at this platform were well addressed. The fact that very few companies pass the stringent listing requirements of the platform itself bears testimony to the rigorous due diligence being carried out by the exchange before listing a new business. The event left the attendees enriched with the knowledge and enthusiasm to venture into these new financial products. This entry was posted in Events, Kolkata and tagged Abhishek Shah, Anirban Kundu, Gauri Shankar, IAIP, India VIX, Lalita Todi, NSE, Runali Bhansali, Vinay Bagri CFA. Bookmark the permalink.